Our great sport of cycling attracts new participants every day. Many of these newbies come to the sport late, having pursued other activities during their prime athletic years. I did. Aussie Rules was my sport of choice growing up and I played it well into my 30s. When my bruised and battered body finally screamed ‘ENOUGH’, I took up cycling. I didn’t know much about it and I hadn’t ridden a bike since my high school years. But I rocked up to my local bike shop, handed over some cash, and walked away with a brand spanking new road bike. I then whacked it in the hardest gear I could push and rode away. And novices all over the world continue to do the same thing – push heavy gears! It took me years to learn that grinding away on the big chain ring was not always the best option. No one had told me otherwise. It is often just taken for granted that new riders will know how to use the multitude of gears that are attached to modern road bikes and that they will know how to pedal their new machine. It couldn’t be further from the truth. In this article I will attempt to explain the basics of gearing and cadence and how these two components are vital to correct pedalling technique. But first let’s go back in time. In the old days it was simple. Bikes were heavy and had a very small selection of gears, if any at all. You had to be as strong as an ox to ride them, especially up hill, and for generations there was no option but to grind your way over mountains, or into the wind, or even along the flats! But thankfully, with new technology and improved sports science, the notion of having to grind your way around a particular course has come to an end. These days its all about spinning! Lance Armstrong might not have been the first to master the technique, but he was the one who popularised it. He was the one everyone sat up and took notice of. Being first across the line in seven consecutive Tours de France does that. His main rival of that time, Jan Ullrich, was a grinder. He pushed heavy gears. In a way, he was a throwback to the past, a dinosaur unwilling or unable to adapt to changing times. Watching him go head-to-head with Armstrong on mountain climbs is a lesson in contrasts. Their pedalling styles are like chalk and cheese. Armstrong’s influence saw a shift in how cyclists approached their riding. Pedalling easier gears at higher cadences became the norm. It is no coincidence that current Tour champion and four time winner Chris Froome is a master at it! See this video of him dragging off Nairo Quintana on Mt. Ventoux during the 2013 Tour de France. Now that’s extreme pedalling! And you know what? If it’s good enough for the pros, then it is good enough for us as well. But shifting into an easier gear and spinning your legs faster than normal does take some time to get used to. It was only after I started dabbling in track cycling that my pedalling technique began to develop. Track bikes have a fixed wheel so you have to keep pedalling no matter what and it is the ideal way to work on maintaining a decent cadence. I jumped back on my road bike after a summer of riding around the velodrome and was amazed at the difference I felt. I could spin a higher cadence for longer which meant I could drop into an easier gear and not lose any speed. In fact I think I became faster. It felt so good. There was less stress on my legs and knees, I was climbing with seemingly less effort, I could push into the wind at a reasonable pace for longer, and I was finishing my rides fresher – all because I was spinning my legs faster and pushing an easier gear. While it may feel unnatural at first, spinning at higher revs will give you a definite advantage. And the best thing is, anyone can do it! Even you! It’s easy. But you have to understand how the gears on your bike work first. Going right back to basics, your multi-speed bike will have up to three chain rings (the large rings that your chain loops around near your pedals) and a cluster of smaller cogs on the back wheel (up to 11 of them). These cogs and chain rings give you a combination of gearing which you can switch between by shifting your chain from one to the other. Each combination will have a certain ‘roll out’, in other words, the distance you travel with one revolution of the pedals. Put simply, if the chain is on the biggest chain ring and the smallest cog, you will travel further with one revolution of the pedals than any of the other gearing combinations. It will also be the hardest gear to push. This is great for belting along the flat with a tail wind, but not so good for climbing. 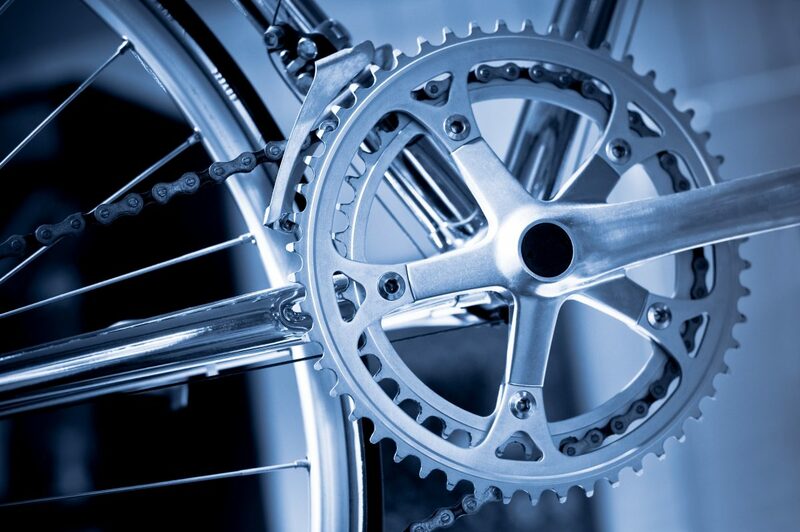 Conversely, if you put the chain on the smallest chain ring and the largest cog, you will travel the least distance with one revolution of the pedals than any of the other gearing combinations. It will also be the easiest gear to push. This is great for climbing, but not so good for going downhill or belting along the flat with a tail wind. Basically, the bigger the chain ring and the smaller the cog, the harder the bike is to push. The smaller the chain ring and the larger the cog, the easier the bike is to push. The trick is to use a combination of these gears to maintain a consistent, smooth pedalling action regardless of the terrain you are riding over. 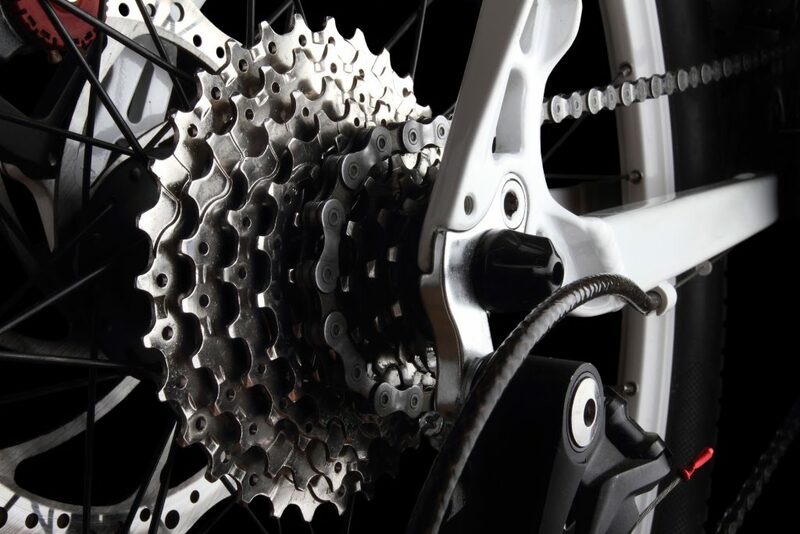 The cogs (pictured) and the chain rings work together to determine your gearing. The smaller the cog and the larger the chain ring, the bigger the gear. For example, if you are spinning a cadence of 90 pedal revolutions a minute on the flat, you’ll need to change into an easier combination to maintain that rate if the road kicks up and you begin climbing. If the road takes a dip, then you may need to change into a harder combination to stop from ‘spinning out’. It sounds complicated, but it isn’t. As you become more experienced you’ll find the act of selecting and shifting between gears becomes automatic. Besides, your legs will soon tell you if you have made a mistake! So, now that you know how your gears work, you have no excuse for trying to climb that hill on the big chain ring. Shift to an easier gear, maintain a higher cadence, and spin your way to the top. Not only will your legs thank you, you’ll get fitter, stronger and faster. Looking to take your cycling to the next level with the right bike or accessories? Check out the bicycles and accessories for sale on Bike Chaser and browse through thousands of new and used bicycle products from retailers and private sellers!